Growing up, most of us are schooled in science, math, social studies, PE, and if we are lucky, arts and music to some extent. Most of us then do what’s expected of us as adults. We get a job, marry, and have kids. Along the way we have not been given one crucial piece of information. Everything is energy. That’s right – EVERYTHING. That includes you, these words you are reading, the device you are reading this on, and the clothes you are wearing. Physics tells us, that on an atomic level, 99.9999% of an atom actually is made up of space. It’s the 0.0001% that is solid and real mass. That leaves us a lot of wiggle room. Could we, then, interact with the space between the molecules? What if we could acknowledge our capacities to manipulate energies? What would happen then? Might we also have the capacity to change energies? We all have the ability to manipulate energy, and we all use it to some extent. For example, I dropped 35lbs in 6 months just a few years ago. I manipulated the energies. Yes, it was forced, but the weight loss did occur. Without changing the underlying patterns, however, true change does not occur. This is the reason why so many people gain back what weight they lost. You’ve got to get to the energetics of the issue. Will alone is not enough. Last August I had an experience where the energetics required changing in order for me to heal a scary condition. I had a spider bite the size of a golf ball that became infected with MRSA. After nearly three weeks of visiting physicians, antibiotics, and hands on Access body process treatments, nothing appeared to be changing. I was wondering what else is possible? I was up at Tony Grove Campground receiving an Access Bars® session. The combined energy of the pine trees and the clearing taking place on a subatomic level from having my bars running resulted in an immediate decrease in the size of the golf ball sized spider bite by half. I knew right then and there that everything would be ok and that it had received healing. The next day it was the size of grape. And in three days it was peanut size. In 4 days it was gone. What I realize now was going on was that I was willing to receive the energy that contributed to the change I was asking for. And, further, I did not have attachment to the result of the outcome, or the way the change showed up. Most of us are taught to deny our capacities starting in childhood. We are not taught how to truly receive. We are told we must have the right answer, again, and again, until it is entrained in us. We are not taught that we know. If we do know, we learn to shun that knowing. But what happens to some of us occasionally, as what occurred for me in Tony Grove, was purely magical. Below are 4 simple, magical tools from the toolkit I am using known as Access Consciousness®. You can use to receive the change you are asking for. But don’t use them if you aren’t ready for change. You will change! The more you ask questions, the more you will see results and will get excited to ask even more questions. There are 2 resources a recommend to delve in further. What would it be like to LIVE IN THE QUESTION? 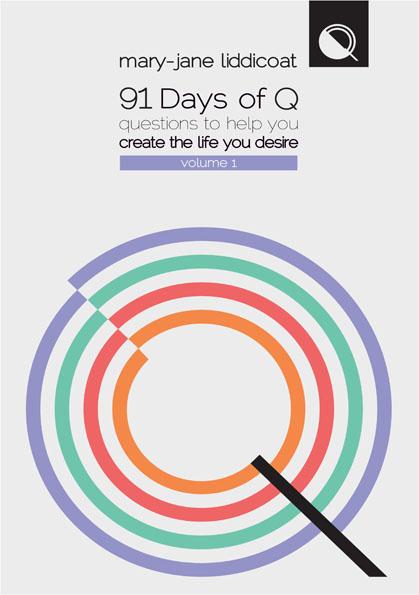 91 Days of Q is a daily three-month collection of questions to help keep you in the zone. Each question is accompanied by examples and background for how and when you might use it…also filled with questions to keep you opening doors to possibilities.